1) 800 m (Grand Prix race) in 3:13.76, 12th out of 15 in my heat, 12th out of 14 in my age group. 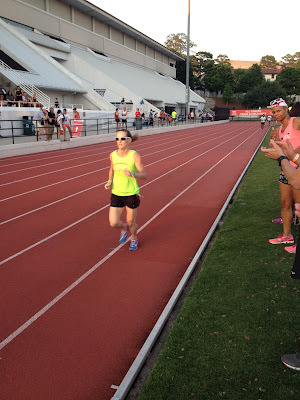 Two weeks ago I ran this distance in 3:25; a year ago I ran in 3:10. 2) About 45 minutes before my heat ran the 800 m, I ran the 200 m to finish my warmup. I was last in my heat (!) but my time of 39.84 sec was better than two weeks ago, when I needed 41.26 sec. It's clear that I'm not a sprinter! However I think that part of my problem is that I don't know how to start quickly. I'm behind the rest of my heat just 10 steps into the race. 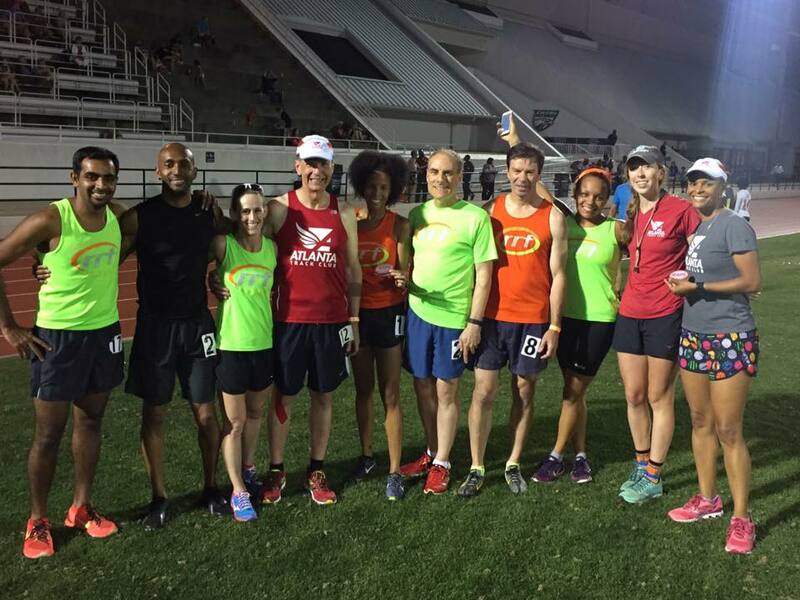 3) I finished off the evening running the mile, in 7:33. I ran the first lap in about 1:45 (409 meters) and the remaining 400 meter laps felt like they were consistently faster than 2:00, so I didn't slow down too badly. I think that I was a bit tired, so I'm not too worried that my time was considerably slower than in the Morningside Mile last month. 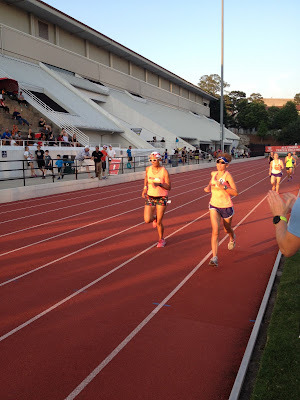 passing another woman in her heat to win 2nd in her age group! runningnerd Carol Gsell finishing strongly! 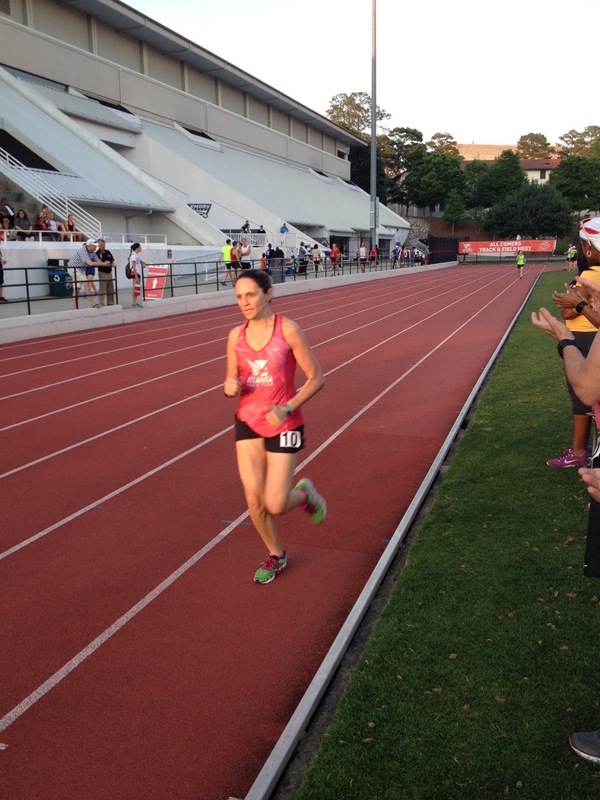 Tucker Running Club speedster Robin Mitchell finished 3rd in her age group! 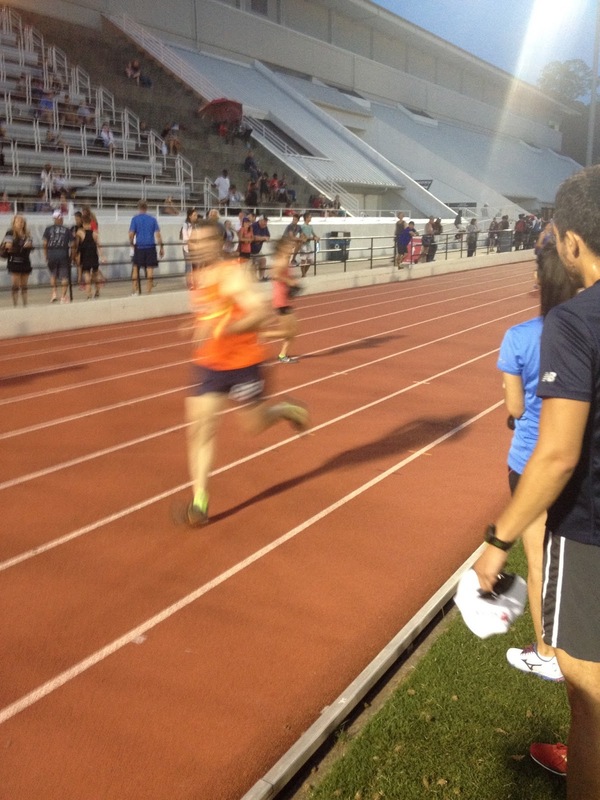 The blur is runningnerd Burt Lieb finishing the 800 m in 2:57. By the time of the men's heats, it was getting dark - but also pleasantly cooler! Atlanta Track Club elite runner Brandon Lasater finishing the mile in 3:59:81! 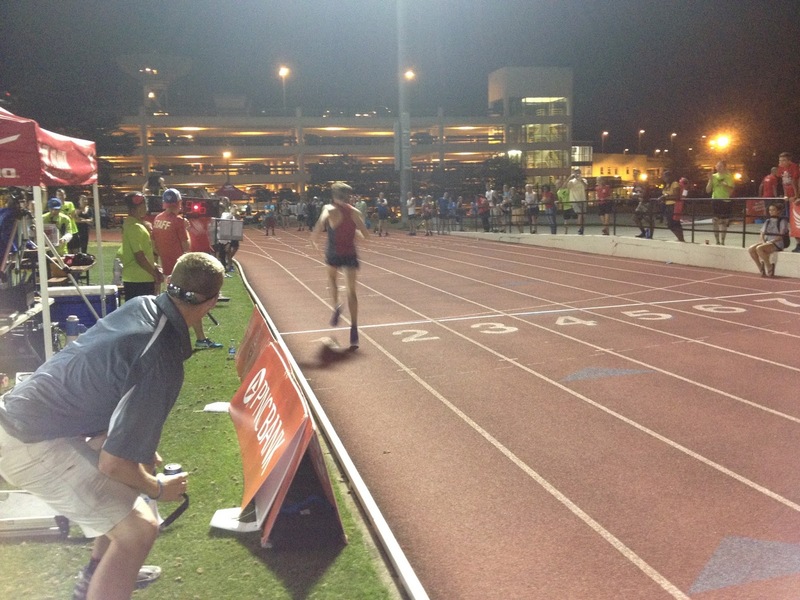 I think that's the first time that I've ever watched someone run a sub-4-minute mile! 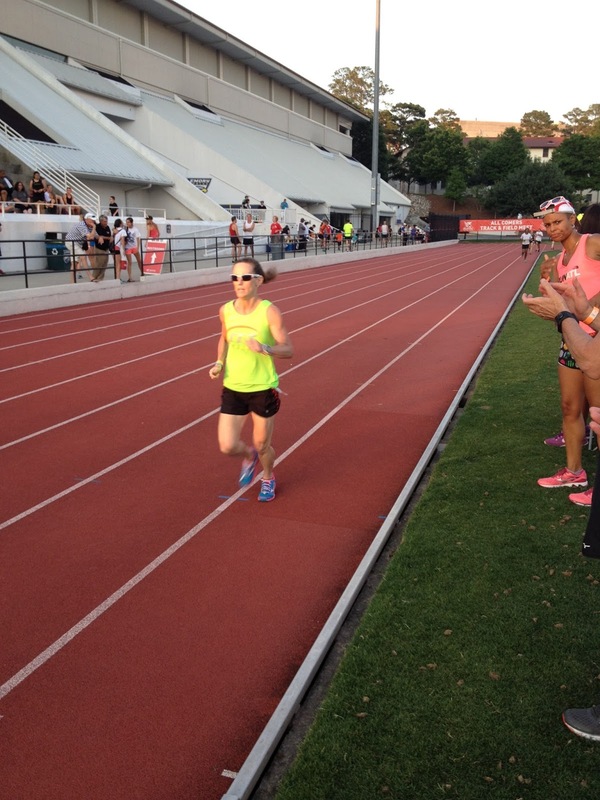 UPDATE, May 27: Betty Lindberg set a world record in her age group for the 800 meters on Tuesday evening! Read all about it here!